We are now processing all orders through our official Motor Snorkel Site located at www.motorsnorkel.com. 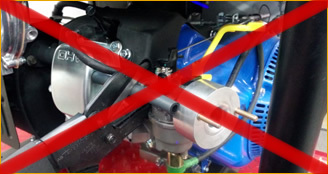 You may be directed to motorsnorkel.com to find a kit that works for your Generator and Engine. The site that you are currently viewing is full of useful and updated information about converting your generator using one of our traditional generator conversion kits or, our newest product, Motor Snorkel. 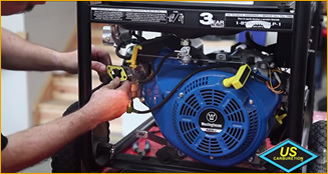 We have replaced our Kit List Page for All Generators and Engines with our convenient Conversion Kit Finder, which will allow you to quickly and easily find the correct kit to change over your gasoline only generator to become a Propane Generator, Natural Gas Generator AND Gasoline Generator. Motor Snorkel is the patented, revolutionary, device that changes your gasoline only generator into a hybrid, tri-fuel machine. 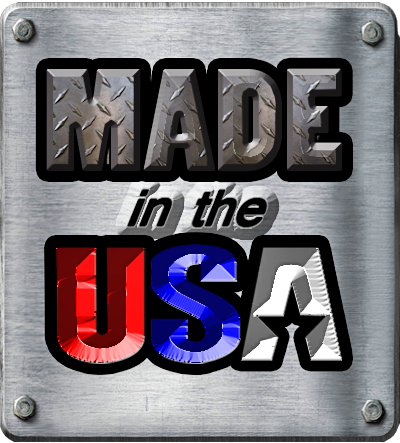 US Carburetion is the industry leading authority on conversion kits to change your gasoline generator into a propane generator or natural gas generator. For 25 years we have been converting more generators than anyone else. In the beginning, our fastest moving kits were for generators using Briggs and Stratton Engines. We originally developed kits that we called Type 1, Type II, Type III, Type IV and Type A and Type C kits. These classic style kits require significant installation effort. You must be prepared to add stud extenders, cut the crank case tube and even to cut the frame! We set out to develop a brand new system. A revolutionary approach that was so simple to install that ANYONE could do it within minutes. Traditional Kits ( Like those sold by our competitors ) Require Complicated Installation. Introducing Motor Snorkel - The world's fastest and easiest way to run your gasoline generator on propane, natural gas AND gasoline. Now, no matter if you have a Briggs and Stratton engine on your generator or any other type of generator, we have a classic conversion kit or a Motor Snorkel kit to help with your do-it-yourself hybrid generator conversion. Use our product finder to find a kit for your generator right now. 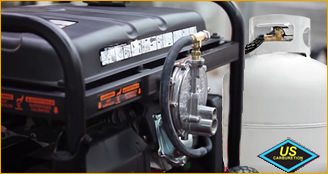 Dependable When It Counts: Propane Generators and Natural Gas Generators. Gasoline is not a fuel that professionals ever choose to use on backup generators. 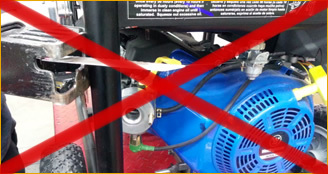 Hospitals and other large facilities "never" install a gasoline back-up generator. They always use natural gas or diesel. Gasoline has a very limited shelf life and will actually cause engine failure. Worst of all when power outages occur due to ice storms, hurricanes, tornadoes, earthquakes and all other disasters, the first commodity to be hoarded is gasoline. Sadly, long lines (even fist fights) and rationing at gas pumps are a common occurrence during many disasters. The hurricanes that have devastated the eastern and gulf coast of the United States over the past 10 years and Hurricane Sandy were sad proof of that. However, working along with FEMA, we were called upon to be of assistance in helping in areas where gasoline was not even available to run generators. Propane generators, and especially natural gas generators, were more plentiful and just the ticket to keep the lights on and the crews working. 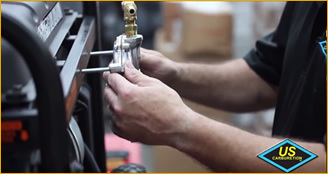 Our do-it-yourself change over kits allow you to run your gasoline generator on propane (LP Gas), natural gas, or all three. Propane and natural gas are truly a backup fuel for a backup generator. Your engine will last longer, start better in cold weather and even start next year when you go to use it in an emergency. The best part is, with one of our do-it-yourself kits you can change your engine from gasoline to propane or natural gas all by yourself. 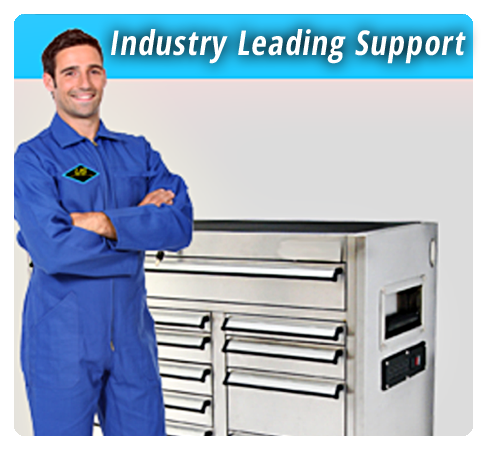 Wouldn’t you rather have a dependable when it counts propane generator or natural gas generator? 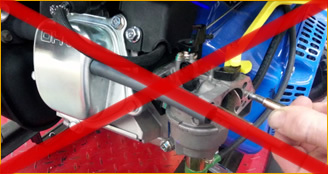 Eliminate the Dirty Port that gasoline carburetors have that shortens the life of an engine.